Construction products and the building sector as a whole have significant impacts on the environment. Policy instruments and market forces are increasingly pushing governments and businesses to document and report environmental impacts and track improvements. One tool that is available to help understand the environmental aspects related to new construction, renovation, and retrofits of buildings and civil engineering works is life cycle assessment (LCA). LCA is a decision-making tool that can help to identify design and construction approaches that yield improved environmental performance. Several European jurisdictions, including Germany, Zurich and Brussels, have made LCA a mandatory requirement prior to issuing a building permit. In addition, the application of LCA to building design and materials selection is a component of green building rating systems. LCA can benefit manufacturers, architects, builders, and government agencies by providing quantitative information about potential environmental impacts and providing data to identify areas for improvement. LCA is a performance-based approach to assessing the environmental aspects related to building design and construction. LCA can be used to understand the potential environmental impacts of a product or structure at every stage of its life; from resource extraction or raw material acquisition, transportation, processing and manufacturing, construction, operation, maintenance and renovation to the end-of-life. LCA is an internationally accepted, science-based methodology which has existed in alternative forms since the 1960s. The requirements and guidance for conducting LCA has been established through international consensus standards; ISO 14040 and ISO 14044. LCA considers all input and output flows (materials, energy, resources) associated with a given product system and is an iterative procedure that includes goal and scope definition, inventory analysis, impact assessment, and interpretation. 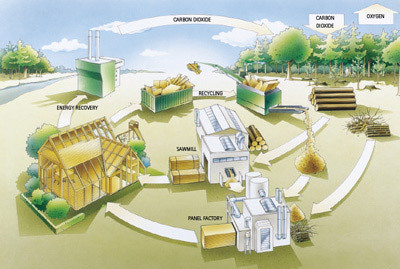 Hazardous and non-hazardous waste generation. LCA tools are available to building designers that are publicly accessible and user friendly. These tools allow designers to rapidly obtain potential environmental impact information for an extensive range of generic building assemblies or develop full building life cycle assessments on their own. LCA software offers building professionals powerful tools for calculating the potential life cycle impacts of building products or assemblies and performing environmental comparisons. It is also possible to use LCA to perform objective comparisons between alternate materials, assemblies and whole buildings, measured over the respective life cycles and based on quantifiable environmental indicators. LCA enables comparison of the environmental trade-offs associated with choosing one material or design solution over another and, as a result, provides an effective basis for comparing relative environmental implications of alternative building design scenarios. An LCA that examines alternative design options must ensure functional equivalence. Each design scenario considered, including the whole building, must meet building code requirements and offer a minimum level of technical performance or functional equivalence. For something as complex as a building, this means tracking and tallying the environmental inputs and outputs for the multitude of assemblies, subassemblies and components in each design option. The longevity of a building system also impacts the environmental performance. Wood buildings can remain in service for long periods of time if they are designed, built and maintained properly. Numerous LCA studies worldwide have demonstrated that wood building products and systems can yield environmental advantages over other building materials and methods of construction. FPInnovations conducted a LCA of a four-storey building in Quebec constructed using cross-laminated timber (CLT). The study assessed how the CLT design would compare with a functionally equivalent concrete and steel building of the same floor area, and found improved environmental performance in two of six impact categories, and equivalent performance in the rest. In addition, at the end-of-life, bio-based products have the ability to become part of a subsequent product system when reused, recycled or recovered for energy; potentially reducing environmental impacts and contributing to the circular economy. FPInnovations. A Comparative Life Cycle Assessment of Two Multistory Residential Buildings: Cross-Laminated Timber vs. Concrete Slab and Column with Light Gauge Steel Walls, 2013.